Kentucky summers have been known to get a little rambunctious from time to time. While this statement may not seem like a big deal, the consequences of bad weather can create major headaches for homeowners everywhere. HCI Roofing and Construction is proud to be a quality provider of roof repairs to Louisville homes, serving with quality, honesty, and pride in order to deliver you the best results that are guaranteed to last. When hail comes to town, it’s essential to call your local roofing contractors for any necessary inspections and repairs. 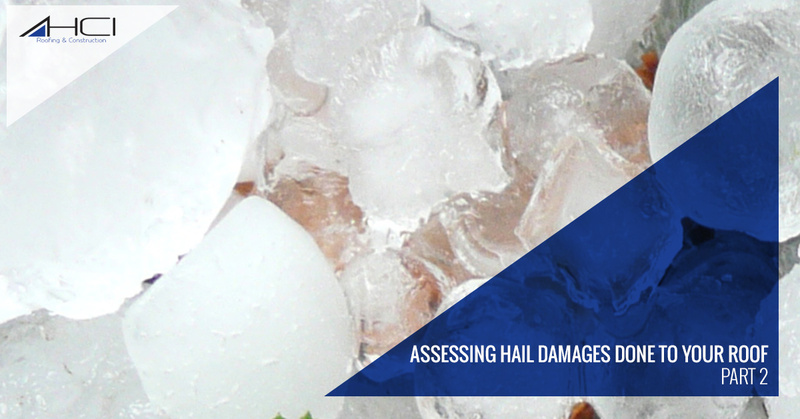 Today, we’ll continue our blog series that looks into the process of assessing hail damage and discerning whether or not you need a roofing repairs. Being able to proactively check on your roof after a storm can prove beneficial for many reasons. If you are unsure on how to do so, be sure to contact our roofing company for help! Your roof works vigilantly to protect your home from the outside world. In doing so, it can sustain damage from various sources. It’s important to be able to identify hail damage to your roofing system in order to better understand when it is necessary to call for roof repairs. The type of shingle can also dictate whether or not those damages are indeed from hail. Asphalt shingles, for example, will hold a random pattern of damage marks across your roof. The key to distinguishing hail from the myriad of other damages is the freshness of the exposed felt. While older damages will expose the black material beneath the granules, fresh hits from hail will shine with a very pronounced black. If the felt has not weathered, you may be dealing with new issues. You can also feel the hit spots, as they will feel soft and almost bruised. When you’re unsure, be sure to check the amount of loose granules, as hail impacts can easily misplace these small pieces. Wood shingles degrade in their own way from storm damage. You will be looking for splits in your shingles that did not deteriorate from age, wind, or sunshine. Shingles that are split with sharp corners and edges are a good sign that hail trauma compromised their integrity. Split shingles with no deterioration on the edges also represent a sure sign of hail damage. Essentially, your wood shingle is designed to last for years without failing, falling apart very slowly. Any splits that do not show aging or long-term deformities can probably be contributed to hail damage. It’s also helpful to look for dents or hail impact marks where the splits originated. If you see an impression from hail, it’s best to call for roofing repairs! HCI Roofing & Construction is your source for unbeatable roof repairs in Louisville. Our experienced contractors are here to deliver a comprehensive set of services to ensure that your house is optimally protected at all times. From siding and gutters to custom porches and more, our roofing company is here to restore your home’s beauty. Contact us today to learn more or to receive a quote on your roofing needs!